How can we get business travellers to choose the train before the plane? 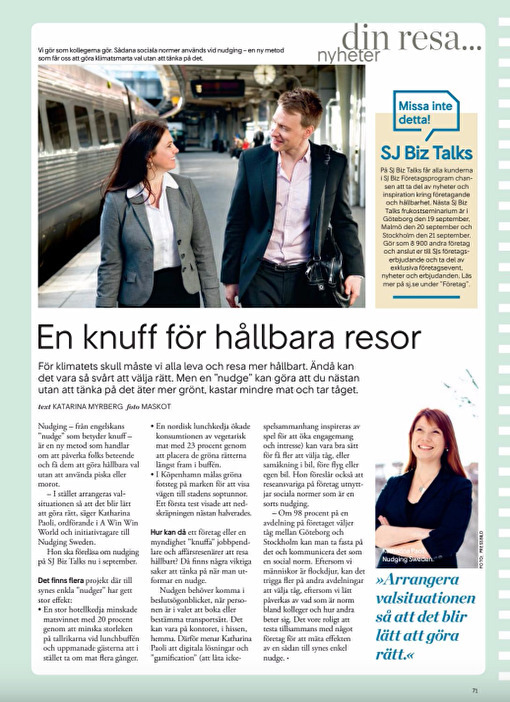 In the end of September Nudging Sweden are going on a tour with SJ, Sweden's market-leading train operating company. Our founder Katharina Paoli will be giving inspirational talks and teach nudging techniques at the SJ Biz breakfast seminars in Stockholm, Gothenburg and Malmö, Sep 19–21. Hopefully nudging can help Swedish coorporations to make travelling by train the number one choice for future domestic travels. Read this brand new interview with Katharina Paoli in the onboard magazine Kupé ( in Swedish), page 71.